You’ve got options when it comes to advanced hydrologic services to solve your water resource, environmental and hydropower needs. That’s when a little good advice and an innovative approach can come in handy. WaterCube founders have a unique combination of skills and expertise with over 20 years in their respective fields of river science, software design and services, ADCP patented technology, remote-sensing, and data analysis techniques. 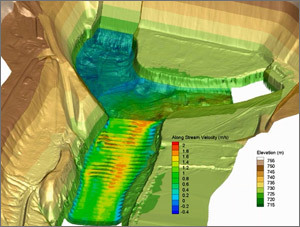 Our vision is to provide our clients with high-quality 3D spatial views of bathymetry and velocity data for rivers, reservoirs and floodplains using the most advanced sensing and visualization technologies in the world in the most efficient and affordable manner. 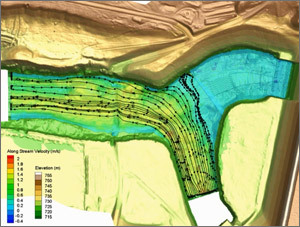 By introducing a unique approach and complete workflow for mapping large or small spatial river sections, WaterCube quickly provides digital elevation models (DEMs) and various 3D maps of water velocity, volume, inundation area, and channel hydraulics delivered in a state-of-the art visualization environment that enables you to quickly analyze results. Evaluate Your Data In Days, Not Weeks! 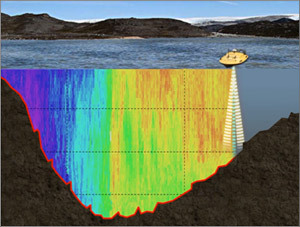 WaterCube uses real data to produce our images and utilizes multiple data acquisition technologies including the latest ADCP’s; airborne, terrestrial, and mobile LiDAR; RTK-GPS; Single-beam echo sounders (SBEs) and more. We quality-review, screen and combine all measured data using our own unique data processing engine for qualitatively and quantitatively evaluating large spatial reaches of rivers, reservoirs, and floodplains in days not weeks.